The Heritage Council, in partnership with the Department of Agriculture, Food and the Marine, is opening the annual grants scheme to GLAS participants for the conservation and repair of traditional farm buildings and other related structures. Only farmers approved in the Green Low-Carbon Agri-Environment Scheme (GLAS) are eligible to apply. The principal objective of this scheme is to ensure that traditional farm buildings and other related structures that contribute to the character of the landscape, and are of significant heritage value, are conserved for active agricultural use. Grant amounts vary between €4,000 and €25,000. A grant award will not be for more than 75% of the cost of the works with a maximum available grant of €25,000. The grant is available for the conservation of traditional farm outbuildings, including roof, walls, structural repairs, windows and doors. The grant is also available for other related farm structures including historic yard surfaces, walls, gate pillars and gates. The key conservation principle of minimum intervention should apply, that is, carrying out a repair to fix what is wrong but not setting out to do too much work. Works which are, in the opinion of the Heritage Council, restoration works, are very unlikely to be supported with grant aid. The process is highly competitive and it is expected that 50-70 projects will be supported in 2018. To arrive at the Heritage Council no later than 5:00pm on Friday 24th November 2017. Applications made by fax or email will not be accepted. Only farmers approved in the GLAS Scheme are eligible to apply. Please email Anna Meenan at ameenan@heritagecouncil.ie with any queries. 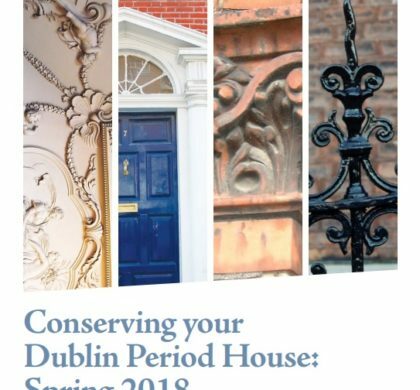 Conserving your Dublin Period House Talks, Spring 2018.